DITA is thrilled to announce that director, Dr. Jeremy Begbie, has two upcoming books from Eerdmans Publishing and Baker Publishing Group. The first, Redeeming Transcendence in the Arts: Bearing Witness to the Triune God, was published February 2018 (available for purchase HERE), and the second, A Peculiar Orthodoxy: Reflections on Theology and the Arts, was published August 2018 (available for purchase HERE). It is widely believed that there is something transcendent about the arts, that they can awaken a profound sense of awe, wonder, and mystery, of something “beyond” this world. Many argue that this opens up fruitful opportunities for conversation with those who may have no use for conventional forms of Christianity. 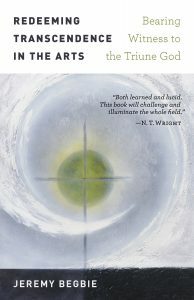 Jeremy Begbie—a leading voice on theology and the arts—in this book employs a biblical, trinitarian imagination to show how Christian involvement in the arts can (and should) be shaped by a vision of God’s transcendence revealed in the person of Jesus Christ. After critiquing some current writing on the subject, he goes on to offer rich resources to help readers engage constructively with the contemporary cultural moment even as they bear witness to the otherness and uncontainability of the triune God of love. World-renowned theologian Jeremy Begbie has been at the forefront of teaching and writing on theology and the arts for more than twenty years. 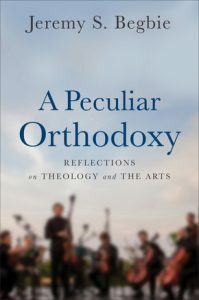 Amid current debates and discussions on the topic, Begbie emphasizes the role of a biblically grounded creedal orthodoxy as he shows how Christian theology and the arts can enrich each other. Throughout the book, Begbie demonstrates the power of classic trinitarian faith to bring illumination, surprise, and delight whenever it engages with the arts.